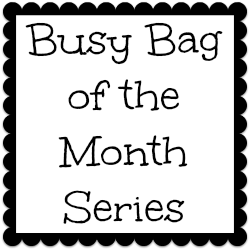 Our Busy Bag of the Month series continues! This time, we made our own sand castle from seashells and sandpaper. It can be stored easily in a bag, and is a fun busy bag for toddlers and preschoolers! I gathered our collection of shells, shell fragments, and rocks from beach trips, and picked out several that would hold up to handling. My kids are not gentle with their busy bags! It was very easy to make. I cut 9×11 sheets sandpaper into several rectangles, and cut notches along the top to resemble battlements. I created 3 rectangular notched “layers” for the main part of the castle, and 2 turrets (one long rectangle and one notched rectangle on top), although you could certainly make your castle set much more elaborate! To decorate the castle with shells, I placed Velcro dots on the sandpaper, and put the corresponding dots onto shells and rocks. Placing the shells onto a target will add in some additional fine motor practice. Also when the sandpaper shifts, the shells will stay in place. I also left in a bunch of shells and rocks without the Velcro, so their creativity wouldn’t be bound by my decision of where to place the shells. My toddler loves our sand castle in a bag, and my preschooler has already brought his knights to play in our play sand castle! I am so excited to about the letter bugs busy bag The Educators’ Spin On It is sharing this month! Hop on over and check it out! Also, are you following our Busy Bags for the Kiddos Pinterest Board? Come browse, we’re sharing our favorite ideas from around the web. If you have a link to yourself or your favorite busy bag, please leave it below. I’d love to take a look! Looking for more baby and toddler play ideas? Check out Zero to Two: the book of play, an e-book I co-authored! It’s includes 25 step-by-step tutorials with pictures, as well as links to over 50 more ways to play with babies and toddlers – all for $8.99.